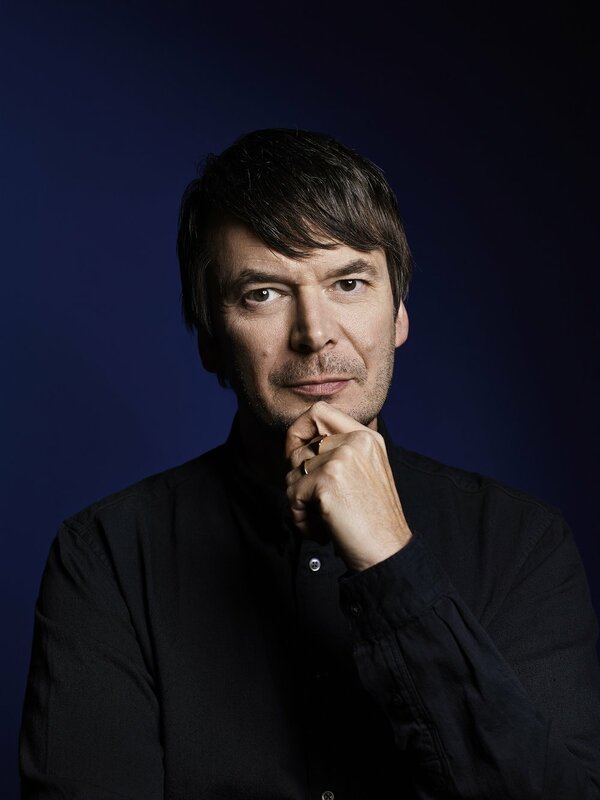 Ian Rankin took some time out from decluttering to chat to Angus MacKinnon of Islay Book Festival about his forthcoming trip to Islay. Ian is joining us for our book festival this year, from 29th August to 1st September. It will be his first-ever trip to Islay. Here is a full transcript of the interview, where he talks about his favourite whiskies, Rebus Rob Roy cocktails, Brexit, and walking in the footsteps of his old friend, the late Iain Banks. AM: Ian, you’re well known as a bit of a whisky buff, so how come you have never been to Islay before? IR: The Hebrides are a bit of a mystery to me. Why? I don’t know except for the fact that I have always lived on the East Coast and I have pretty much stuck to that side of the country. I come through to Glasgow fairly irregularly and almost never get to the islands, so I guess that is why. All I know about Islay is basically the whisky, and maybe, I dunno, Westering Home, or The Maggie maybe, that kind of thing. That is why I am looking forward to visiting really, to just explore the place, drive around and see a bit of the countryside and meet the people. AM: It’ll be a bit of a pilgrimage on the whisky side of things? IR: Hopefully yes. I’ve been a long-term fan of whiskies like Lagavulin, Laphroaig, Caol Ila. Bowmore was my dad’s favourite whisky. He is no longer with us, alas, but I used to get him a bottle for his birthday. So, yeah, there’s definitely going to be a bit of a whisky pilgrimage going on. But he did get there first so I will certainly be following in his footsteps when I’m exploring some of the malt whiskies on Islay. AM: How important an influence was Iain on your enthusiasm for single malt? IR: There was a bunch of Edinburgh-based writers who used to meet up and we would sometimes head down to the Malt Whisky Society and sometimes we would just sit in a nice central bar like The Abbotsford, somewhere that had a decent supply of Malt whiskies, and we would have a wee tasting session. But mostly it was about the conviviality and the conversation, which is what I always associate with whisky anyway. It’s that thing that it’s something you have when you are having a chat with somebody. It’s funny, we just had a wee reunion a few weeks ago in Iain’s house up in North Queensferry and we were saying we never do that anymore. We never go to The Abbotsford and it is because his great ghost would always be there. There would always be that other person at the table who we’re missing terribly. We are going to try and maybe reconvene somewhere else that doesn’t have those ghosts sitting there. AM: Iain obviously had a great connection with Islay, did he ever regale you with stories about the island? He and I used to get mistaken for each other a lot. I once went to give a talk at a High School in Fife and the headmaster got up and said to the students, ‘We are so lucky we’ve got Iain Banks with us today.’ And Iain would get mail for me sent to his address and vice versa. Two writers, both from Fife, with very similar names and a similar interest in whisky. It is a weird coincidence and of course we never, you know in the early days, we never met because I was living in London and then I moved to France when I started reading his books and we used to communicate by letters. I’d be sitting in France and a letter would pop through the door from Iain in North Queensferry and I would send a letter back to him. I am doing a bit of decluttering and I have just come across a whole bunch of correspondence, which is going to go to the National Library of Scotland. AM: Anything that stood out? IR: There was one funny ‘P.S.’, where he goes ‘Who’s Irvine Welsh?’ He was living in Scotland but Trainspotting was slow to get to him, whereas living in rural France, I knew all about Trainspotting. It was a funny thing, I knew about Trainspotting before he did and yet there he was living and working in Scotland. AM: The advantages of the single market in literature? IR: Ha, ha. Yes. One of many! AM: Islay is not just about whisky of course and I know you’ve got a house on the Black Isle. Does that mean you’re a bit of a nature buff as well? Are you a bit of a twitcher? Can you tell a buzzard from a golden eagle? IR: I have become a birdwatcher by default, I think. I was never a great one when I was younger but you know if you go for a coastal or a countryside walk and you see a bird, you want to know what it is so, yeah, I probably could tell a buzzard these days because of the shape of the tail. My wife’s a good one for explaining to me the differences between moorhens and whatever and this kind of duck and that kind of duck and the difference between birds of prey. We are right on the water front at Cromarty and we have a lot of coastal walks and I do enjoy those. If it is cold you wrap up, if it’s raining you put a hood up. The weather does not tend to deter me, and nor could it when you live somewhere like Cromarty. AM: You were an early adoptor of the single malt trend. What was it about malt that appealed to the young Ian? IR: I like a kind of rich, strong, peaty flavour, which is why I tend to go for the Lagavulins and the Laphroaigs of this world. Maybe that is because my taste buds are not what they once were. I don’t have that refined palate maybe. But I think every whisky is different. Every whisky I’ve ever drunk is slightly different from every other whisky and you get that lovely thing the French call ‘terroir’ – you get a lovely sense of the countryside where it was made, the work that was put into it, the particulars of the grains that were used and the water that is used, and the way everything is fired. All of that becomes part of the whisky, it becomes part of the story. And you know, writers, in general, we like stories. We like stories to be attached to things and with whisky there is always a story attached to the particular distillery or the particular part of the country where the whisky is made. AM: That’s reflected in the Rebus books – his taste develops over time? IR: Well it depends on who’s buying! If someone else is buying, Rebus will go for an expensive malt, but if he is buying himself he tends to go for the cheaper stuff. But he has always got a couple of decent bottles at home and last thing at night he does that thing that I do as well – if you’ve had a hard and a busy day you sit down in your living room at night, you’ve got a couple of lamps on, the big lights on. You put on a record that is going to chill you out, music that will calm you down and you have a whisky or two. It is part of the process of relaxation. And he is someone who likes to speculate, he likes to think and lose himself in his thoughts and again a glass or two of whisky is very good for that. AM: There’s that famous expression of Burns – “whisky and freedom gang tigether” – do you think that is about the creative process? IR: I think in Burns an awful lot of it comes down to community. It comes down to the aspect of communal drinking and there is a place for that as well. There’s the whisky that I have late at night after a hard day’s writing and then there’s the whisky that I have in the pub with friends and they are very different experiences. And it is a thing that brings people together, it is a very communal thing. One of the great sadnesses for me is that the old fashioned howff, the old-fashioned bar, is becoming a thing of the past. It is becoming harder to sustain them. It is hard to get young people to go into pubs these days. They want to sit at home with their devices and sometimes when they go to the pub they are taken away from them for half an hour and that is a shock to the system. I think there’s something to be said for keeping the howff alive and keeping alive the notion of communal drinking. You go out and you relax, enjoy yourself and catch up with people. You meet strangers and those strangers become friends. The number of times I’ve gone to the Oxford Bar in Edinburgh and met somebody for the first time and then they become a regular and we stay in touch. Or whenever they are in Edinburgh they come back to the Oxford Bar because they know the TV is not going to be on, there’s music playing, there is no food being served and it’s just about the drink and the conversation. AM: Yes, that was something Billy Connolly said recently. Even though he does not drink any more, he misses that kind of environment? IR: Yeah, well in the very rare weeks and months when I’ve decided to cut back on the booze, I still go to the pub because I just like the atmosphere and I catch up with friends and I make new friends. It’s [about being] part of that community and it always was, even when I was growing up in rural Fife. The local bar was where your parents went, it was where you and your friends went, it was where you got the local gossip. In a place like Cromarty that still happens. Whenever I am up there, to get the news, the first thing I do when I get out of the car and into the house is go to the pub. AM: That’d be a very effective way of getting the news on Islay! One of the malts Rebus enjoys is Laphroaig, which is sometimes described as the marmite of the whisky world. Was it a conscious choice to associate him with that whisky because of its ‘it’s not for everybody’ aspect? IR: I guess there might be that, but I think it was more basic in that I like Laphroaig so I thought Rebus would like it as well. He likes strong meat and strong drink, he likes strong flavours, he likes strong textures. He likes nothing in moderation and you know Laphroaig has a really powerful flavour to it but, as you say, it is not for everybody. But it is the sort of thing that would really appeal to someone like Rebus and maybe it not being to everybody’s taste is part of the attraction for him because he is not to everyone’s taste either. He is a person, a character who divides people who come into contact with him. Readers like him but other characters in the book can see him as being a bit prickly, a bit difficult, so maybe that is how his character comes across in some of his choices. AM: Have you tried Kilchoman and the second generation Bruichladdich? Are you aware of what they are trying to do in terms of connecting with that idea of ‘terroir’ that you were talking about? IR: Absolutely, and I do think that is something that whisky producers have done in the past. We do need to come back to that notion of terroir, that notion that our drink has a story to tell and you can be part of that story. Having lived in France for six years in the early ‘90s, you get it everywhere you go in France. Whether it is the food or the drink, the local area has its own story to tell and I think Scottish whisky has got a story to tell because the flavours are so distinct, from the different regions where whisky is made. So there are these stories to be told and also there is a new audience to be found. One of the things that younger whisky makers and the marketing people are doing now is trying to sell whisky to a younger audience, coming up with cocktails. You think it is not easy to do whisky in a cocktail, but it can be done. For a while there was even a Rebus cocktail at the Caledonian Hotel in Edinburgh. IR: It was called a Rebus Rob Roy. It was basically a Rob Roy but they added a wee bit of foam from an IPA to the top of it so it almost looked like a half pint of beer. It was a homage to Rebus because I’d mentioned the hotel in a couple of the books, so as a thank you they thought they would design a drink for Rebus. I did like it. I had a few the first night they introduced it and I went back a couple of times afterwards. But I think it has now been taken off the menu, so maybe again it was a difficult sell. AM: The Rebus novels have charted how Scotland has changed over the course of the three decades you have been producing them. What would you say were the biggest changes that have taken place over that time? IR: The whole structure of the police has changed in Scotland, from having eight regional authorities to having one overarching organisation called Police Scotland. The way that murder inquiries are organised has changed and of course the technology available has changed hugely. If you go back to the early Rebus books, the computer is still not widely available. People tend not to have them in their homes even and certainly in the police station there would be very few available. DNA analysis is not widely used. All this kind of stuff. That has all changed and Scotland has changed with it. Rebus has changed. He has got older. He is now retired, he is no longer a serving police officer, he has some health issues. The world tends to make less sense to him. He looks around in a state of bewilderment at things that happen. The world has moved on but has he moved on with it substantially? He is a bit of a dinosaur in some ways, he has an older way of doing things and an older way of looking at the world. I guess if we talk about changes in Scotland, the biggest change in my lifetime and certainly in the time of the Rebus books has been devolution. And who knows what happens next? The thing is I’m not a science fiction writer so until stuff has happened I cannot speculate or write about it. Brexit gets a very brief mention in the latest book but that is as much as I can do, I can’t write about Brexit until it has actually happened and I know what it means. I can’t write about independence until it happens because I’m not a sci-fi writer. All this flux, all the uncertainty in the world. It is not easy for writers to deal with that. The real world at the moment seems so incredible that fiction writers are scratching their heads and going, ‘Well how do I make sense of this?’ You know, what place is there for fiction in this wildly-seeming fictional world. AM: You’ve often said that you set out planning to write the Great Scottish Novel rather than to be a crime writer. It is not too late for you to have a go at summing it all up, what you have seen and what Rebus has seen in one novel? Philip Roth addressed a lot of the issues we’ve had in Scotland in American Pastoral and that seemed to predict the coming of Trump. Would a bit of you like to kill off Rebus and do something like that? IR: I think the whole sequence of Rebus novels is my answer to that. I don’t think I could do it in a single book. But each Rebus novel takes on a slightly different theme, a different aspect of Scottish life, politics, the economy. I have taken on xenophobia, I have taken on religious bigotry. The themes are there in the books and each book is a piece of the jigsaw and when I finish the series, if the good Lord spares me, hopefully you will have a fairly complete jigsaw of the way Scotland was at the end of the 20th and beginning of the 21st century. I can’t imagine trying to do it over one book. My books are getting shorter and it would have to be a very long book. AM: This year is a year off from writing novels? IR: Hopefully. I’m flitting. We’re downsizing. So the first half of the year is going to be taken up with selling the house, moving to an apartment etc. There is a lot of decluttering to be done. So I can’t get my head into a space where I can imagine writing a book. But hopefully that is all done and dusted by the summer and that allows me the autumn and winter to think about do I want to start a new book? Do I want to try something else, just keep my hand in? So I’ll see. At the moment it is up in the air. I have got an American tour to get out of the way and then I’ve got to get the house sold and move everything out. Once that is all done and dusted I can start to think what comes next. AM: You lived in France for a number of years. That probably is going to become a harder thing to do for people now with Brexit. How do you feel about that – is it a big source of regret? – and also about the current situation. We can’t seem to resolve the issue. How are you feeling about that? IR: Well, it is a mess. It is a mess that my generation will survive but it is the generation that is coming after us. It is making the world not only more difficult for the next generation and for generations to come but actually making the world much more insular. We have had a period of stability, a period where borders have been opened up, where travel has been much more accessible, where different cultures have become more accessible than ever. And to actually put barriers in the way of that is, I think, incredibly frustrating. And as I say, it is not my generation that is going to suffer, it is the generations that are coming after us. One of the problems we have got everywhere is the disaffection of young people – young people just deciding they can’t be bothered voting. They don’t think they can effect change and so, you know, you just hope that people start to see sense and that rational minds are brought to bear on these problems. People start to think with their heads not their hearts. AM: For you, would seeing sense involve going back to the voters as a way out of the current impasse? IR: I honestly don’t know. What happens if we have another referendum and it goes the same way. You know, by 51-49: nothing has been changed, nothing has been solved. It was just a very, very stupid thing to have done in the first place. The reasons behind it were so narrow and the thought that had gone into it was so narrow and what the repercussions would be, nobody had considered. We need some big philosophical, social and economic thinkers who can give some clarity and some rationality to what is a fairly irrational process at the moment. The problem is that Brexit is just part of a much, much bigger issue. It is partly what has seen Trump get into the White House, it is what has seen the rise of the far right in some countries and the far left in other countries. It is that disaffection, that sense that people are not being served by their political masters. They are not being listened to, they feel they are being left behind. And if you give them a vote they are going to stick two fingers up to you in the way that they vote. All these huge philosophical and structural problems are going to have to be dealt with at some point. For decades we have been hiding our heads in the sands about this. And suddenly we are seeing these connected world issues stretch back quite a long way. It is a scary time, man, it is a scary time. I am not the first person to say it, it feels like the 1930s in terms of what is going on in the world. In the past whenever we have had these problems they have usually led to war. You just hope that this time it does not happen but who knows. AM: We are really happy you’ve agreed to come and see us on Islay. You do make a lot of effort to interact with your fans, on Twitter for example, and I was wondering if you see it as important to reach out to some of the people who are more out of the way, if you like. IR: It is very flattering that your books are loved everywhere but an author can’t go everywhere. And so when a book is published it tends to be the big urban conurbations that get the biggest bite of the cherry. So I tend to go to the big cities. So when a festival happens somewhere it is a chance for me to go a bit further afield. I could happily spend the whole year, every year, accepting invitations to go round the world to festivals and bookshops talking to people. But I’d get no work done if I did that. So because it is a slightly quiet year, January to June I would normally be writing a book and this January to June I’m not, it has meant that I can do a bit more travelling going to places I wouldn’t normally get a chance to go to. As a full-time writer you are always conscious that if you are not writing, you are not earning. AM: The Rebus play is now on a second run. What are the plans for it afterwards and would you like to see it tour the Highlands and Islands? IR: I would love it to play everywhere, but again, you can’t always accommodate every request. It depends on the finance. None of this is anything to do with me but it depends on the availability of the theatres, the financing. How do you finance it if it is going to go to smaller venues that are not so easy to get to? Are the actors willing to do it, have they got enough time on their hands to do it? All of that is in the hands of the producers, but yeah, I want as many people as possible to see it and it is quite frustrating that nobody has thought of filming it at one of its performances because at least then there would be a record that would be available to people in the future. But yeah, we are talking about doing another play at some time in the future because it has been successful and I enjoyed it. I’ve seen it twice so far and I think I’m going to see it again in Newcastle. I saw it with the original actor but now the January run is with Ron Donnachie. The actor playing Rebus has changed and Ron has played Rebus on the radio, still does, whenever there is a Rebus play on the BBC it is Ron, so he knows the character and he knows the books, so I am really looking forward to seeing him on stage. AM: Would a second play be another collaboration with Rona Munro? IR: I would love to but it depends how busy she is. I know she is a busy playwright it depends on whether (a) she wants to do it, and (b) if she is available to do it. It is all pie in the sky until it happens. Ian Rankin interview with Angus MacKinnon of Islay Book Festival. Interview conducted by telephone Friday January 18, 2019. A recording is available to substantiate transcript. Questions have been edited for brevity.